Not only is it evolving within its own technological capabilities, but it’s evolving the way people can power their lives. An entire industry of energy has a new outlook and a brighter future because of the lowering costs of harnessing energy from light. And every bit of it is renewable, and in some cases, reusable. Whether your means of capturing energy sits upon the roof of a house, or is used by capturing the ambient lighting powered by that previously harnessed solar energy, you can count on the energy to be there over and over. With that kind of reliability, to go with the lowering costs, solar power stands on the verge of replacing the fossil fuels of yesteryear and guiding America, and ideally the world, into a brighter future of cleaner energy. California is just as appropriate for energy production as Texas is. While Texas naturally has plenty of oil in the ground, California has an abundance of sunlight and a state government that offers incentives for companies to develop alternative energy sources. By now you can gather that there are numerous solar power companies in California. While solar hasn’t gotten the recent media attention that wind and natural gas have, it was a forerunner of the alternative energy movement and still remains as probably the best source of alternative energy for residential buildings. While wind makes sense when discussing the electrical grid and natural gas may be a boon for industrial and automobile applications, solar makes the most sense for individual structures. It doesn’t just stop at homes either. Commercial buildings can also benefit from having solar panels installed. They provide your property with a self-sustaining energy source. Solar brings with it many benefits. Homeowners and business owners from Orange County, San Bernardino County and more have already made the switch because after the initial investment in the solar panels, they begin to pay for themselves. The first thing you’ll notice is that there are government provided incentives to switch in the form of tax credits. The value of your property also increases significantly. You are also freed from the whims of utility companies for the most part. You’re still technically reliant on the grid, but only if you use more power than you take in with your solar panels. 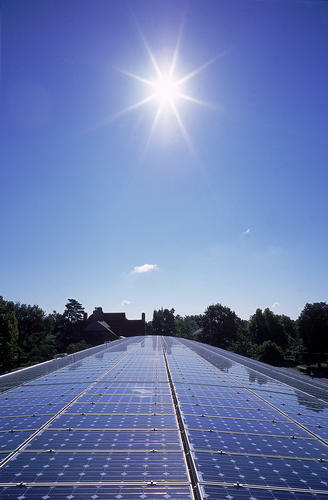 While the cost of energy from the grid can fluctuate, with solar you can plan better. Californians are lucky because sunlight is so plentiful. They have no problem getting the solar energy they need to power their property. Being responsible for your own energy lowers monthly costs and provides consistency. You’ll know what you use month to month and can be confident knowing you’ll be paying roughly the same thing every month. It’s an interesting point about a small need of fossil fuels remaining for the likes of automobiles and certain industrial demands, but outside of that, solar is an ideal option for powering the rest of our lives. Even with the needs of capturing energy on the go, maybe for charging a cell phone or a tablet, solar energy can provide clean solutions that fossil fuels can’t offer to the same degree. And as technology progresses, all of these needs will be met better and more effectively.